I am an Amazon Prime member. This gives me access to the large library of included free streaming movies and television available to US-based Prime members. The KFHD has a MicroUSB port. I have used this port and a $2 cable from Monoprice.com to play the above mentioned media to my HD television. With my new Sony sound bar, the output looks good and sounds great. The price. At the end of the day (using giftcards and coupons), I got the KFHD for $30. I did just spend an additional $35 on a SquareTrade Accidental Damage warranty, since I plan on not really using a case for the KFHD. If you aren't technologically savvy, a KFHD with the stock apps and downloads from Amazon's App Store may be enough. Especially if you're a reader and are just reading books, checking email and Facebook and doing some light web surfing. Amazon's Silk browser isn't really living up to the hype, though. You can open up attachments in the standard version of OfficePro. But if you're a bit more technologically astute, I would recommend 'sideloading'. Sideloading is the process of manually loading an app (called an APK) to the KFHD. Change your KFHD's settings to allow for third party apps, install a file manager app from the Amazon App Store (I like ES File Explorer) and you're all set. This is how my KFHD has really become quite useful. Using the XDA developer forums and Reddit's Kindle Fire subreddit, I was able to discover the 'Google Apps' zip file. This has allowed me to get a KFHD Gmail client, Google Maps, Google Talk and most importantly- Chrome on my KFHD. 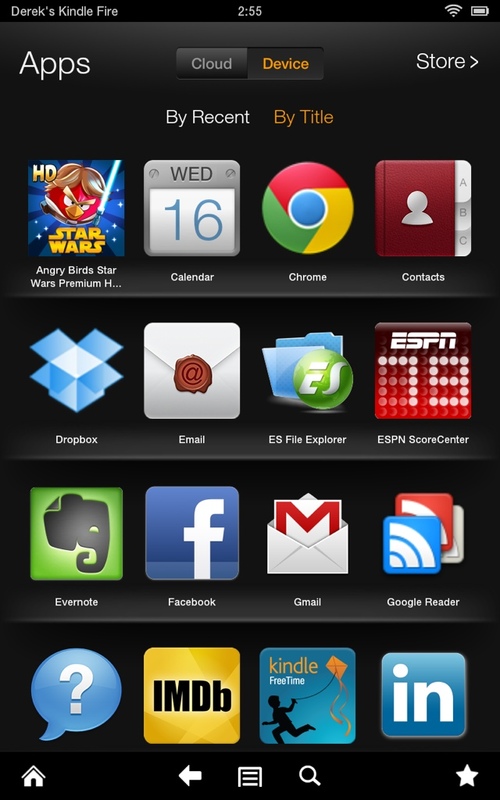 I was also able to sideload a number of apps that I use daily on my iPad, including Dropbox, Zite and Wunderlist. So far, the only hiccup has been that for the Google apps, you must turn off the notifications or else the Kindle's status bar will disappear. A few simple clicks and that's taken care of. I use the stock email app to alert me and head over to Gmail in order to do any real emailing. The reviews are correct- the Amazon App Store is definitely limited compared with Google Play or the Apple App Store. But that's OK by me- the KFHD isn't my main tablet. If there's an app I really need and not on the Amazon App Store- I'll try and find the apk online. If I can't find a trustworthy APK, I'll fire up my old Droid X and download the app from Google Play. Then, I back it up to the Droid X's SD card, connect it to my computer and copy it over to the KFHD. A few extra steps? Sure. But I saved myself a bunch of money and I get to tinker a bit with all those devices. So, I've got some apps on it- what am I actually doing with the KFHD? Pretty much what I said at the beginning- it's my armchair companion. Instead of having my iPad open and on my lap while watching TV, I have the KFHD. It fits nicely in one hand to read a book, much like my Kindle Keyboard. The screen is quite nice and is easier on the eyes (resolution-wise, that is) than my iPad 2. It's portable enough to just slip in a pouch with my MiFi and earbuds and take it with me. Much less bulky than carrying around my iPad in a case. The verdict is still out on the KFHD long-term, but as an Amazon Prime member- I am definitely taking advantage of the larger movie and TV ecosystem. I haven't changed my spending habits, though. I don't think a device is going to make me do that! Next steps? I am thinking that once I get bored of the stock look and feel, it'll be time to start playing with 'rooting' the device. Perhaps I'll just root it to remove the carousel and run Fancy Widgets or even take the plunge and completely wipe it and replace with Cyanogenmod. But the moral of the story is, the Kindle Fire HD 7 isn't really a bad option as an additional media consumption or companion device. Would I use it as replacement for my iPad? Nope. Would I use it as an optional or secondary device? Absolutely. And so far, the KFHD is doing a pretty good job at it. And yes, I posted this via Blogsy on my iPad. But it was written (in Evernote) on my Dell Inspiron 11z, which I used to call a netbook, but it really isn't anymore. I'm thinking that a “what's in my bag” entry should be next on the blog roll!